Footage of an interview with the police commissioner, Raymond W. Kelly, is used in the movie. While some groups are giving Ray Kelly this kind of reception at his lectures, the “Muslim Advisory Council” thought it was a good idea to reward the former NYPD chief spy. “The Muslim community appears to be softening its stance toward Ray Kelly as he walks out the door,” one tabloid crowed, suggesting that a Muslim council of 10 members hand-picked by the NYPD represented Muslim New Yorkers in all their diversity. But the meaning of the award granted Dec. 9 by the Muslim Advisory Council, set up by the NYPD in 2012, is very much up for debate. New York’s hundreds of thousands of Muslims come from backgrounds rich and poor, from lands far away to uptown Harlem. The Muslim Advisory Council award — derided by the New York chapter of the Council on American-Islam Relations as a “cheap public relations stunt” — highlights the diverse reactions to revelations of police surveillance of Muslims. Some Muslims have retreated into silent distrust. Others have expressed outrage. A third group sees a different path — trying to engage. But for Jaber, who said he was one of three council members who have resigned since the group’s first meeting in July 2012, idea and reality never really met on the council. The group has been granted unusually rich access to the head of the nation’s largest police force, meeting with him at least three times. In those meetings, however, Jaber said the commissioner rarely strayed from NYPD public talking points about the surveillance of Muslims. Other members of the Muslim Advisory Council, however, have continued to try to bend Kelly’s ear, even as Associated Press revelations about the department’s extensive surveillance of Muslims dripped out. Kukiqi said he was stung last year when an “Albanian Locations of Concern” report produced by the NYPD in 2006 listed his cultural center. He saw joining the council as an opportunity to clear up “misconceptions” and said it has been a useful forum for everything from complaining about parking enforcement — a perennial concern — to receiving information about hate crimes against Muslims. 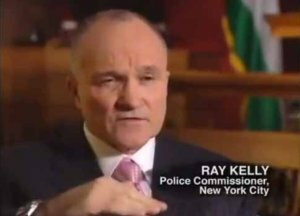 “While there may be a tiny minority of Muslims who do support Ray Kelly’s actions — those who are perhaps unaware of the damage done by NYPD predatory policing — the vast majority of Muslim New Yorkers do not support or applaud his ineffective and biased policies,” Ryan Mahoney, president of the group’s New York chapter, said in a statement. At almost the same time it was giving Kelly his award, the advisory council submitted a Dec. 1 memo highlighting controversies that have marred the relations of Kelly’s police department with Muslims: a “radicalization” study panned by civil liberties groups, an Islamophobic screed featuring an interview with Kelly that was screenedas a training video for NYPD cadets, and “terrorism enterprise investigations” that have listened in on imams as they deliver sermons. This poll is completely bogus in my view. It seems to be comparing the attitudes of Muslim immigrants with native Christians and then ignoring this “immigrant vs. native” dynamic altogether as if it is not even relevant as a confounding variable. As the study confessed, the immigrants are statistically close to the opinions of their home countries, so what this poll is really measuring are country vs. country differences, not “Christian fundamentalism” vs. “Muslim fundamentalism”. Moreover, the three survey questions themselves (worded as statements to agree or disagree with) are quite biased and leading, making at least one of them almost irrelevant. For example, the first one is, “I don’t want to have homosexuals as friends”. Just because a person “doesn’t want to have homosexuals as friends” does not mean that person has any desire or intention whatsoever to discriminate against homosexuals. The former does not necessarily imply the latter at all, and it is the latter that is the only variable of social concern. Notice how the question doesn’t even measure if the respondents are neutral or don’t care if their friends are homosexual. It only asks if the respondents have a positive desire to have homosexuals as friends. Why should such a positive desire be required? The other two questions about trusting Jews and Western power are simply ridiculous measures of “out-group hostility” (due to “fundamentalism”) when you are measuring immigrants who have lived, or been raised as, an out-group to these two powers from their home country, and then trying to compare these results to views of native Christians who have lived as an in-group or neutral beneficiary partner to these two powers/communities their whole lives. Such questions are borderline absurd when measuring the effect of “fundamentalism” in such an extreme context of confounding political, cultural, and regional variables. Even the researchers’ definition of “fundamentalism” is totally wrong with respect to the criterion that is used to measure compliance with that definition. For example, one of the three defining elements of “fundamentalism” is that “religious rules have priority over secular laws”. This is a statement I would strongly DISAGREE with, since even under Sharia law, the rules of the land for others (and thereby for society as a whole) take priority over Sharia law, which is for Muslims only. However, look at the question they used as a criterion to measure compliance with that definition: “The rules of the Bible [Koran] are more important to me than the laws of [survey country]”. This, by contrast, is a statement I would strongly AGREE with, and the main reason is because it adds the words “for me”, vs. the definition quoted above, which implies “for society as a whole”. Also, notice how the subjective criterion of “more important” differs from the objective definition of “have priority over”. Clearly, Islam should be “more important” to Muslims — how could it not be? — but that does NOT mean it should “have priority over” secular laws. That is yet another non-sequitur. I could similarly call into question the other subjective criteria for “fundamentalism” and how they don’t reconcile with the objective definition provided. However, I think my point is made sufficiently enough with this criterion. In short, this is a severely flawed and biased study that has little to no value in addressing the conclusion that the study purports to uphold. In my opinion, it belongs in the trash bin. “Such strong views about dual nationality are all the more striking because 68 percent of the Turkish-origin and 74 percent of the Moroccan-origin Dutch citizens, who have dual nationality report that they feel at home in the Netherlands, compared to 78 and 80 percent (of the same groups) who have only the Dutch nationality. Yes, I’ve heard of Koopmans before and there are various people calling themselves researchers in the Netherlands and Europe associated with universities that write papers on “young Muslim radicalization” – but I haven’t looked at them in awhile. It appears that Muslim youth “radicalization” is high on the soocial science research agendas — and it appears aimed at justifying AIVD spying and treatment of Muslim youth problems as potential national security threats. There appears to be little interest in the same type of “radicalization” of white youth into the far right appears to hold no interest with the Dutch government. The Netherlands is a big country for social science and criminology research, but some appears to be funded by the Dutch government. Note in the article that it states that Koopmans held on to his data and research since 2008. With surveys we need to ask who was polled and how the questions were worded. The vast majority of studies of Muslims, Moroccans, Muslim immigrants paint a different picture than this single study does, and the weight us against Koopmans, but the Dutch government, especially the AIVD and NCTb use these “studies” to justify continued surveillance and pressure on Muslim, largely Moroccan community. The presentation is only 21 pages and, perhaps with the exception of the regression results, pretty easy to follow. The last two pages have results by country. For the regressions, basically, the figures not in parentheses are the additive “effects” of a demographic variable on an outcome (religious fundamentalism or outgroup hostility on a 0-3 scale) after controlling for all the other demographic variables; if the corresponding number in parentheses is less than or equal to 0.05, the result is statistically significant. “Effect” really means that the demographic variable helps predict the outcome and need not imply causation (i.e., correlation versus causation). Well thanks to the Uncle Tommies and sycophant Daisy The Interfaith Cultural Center That Was A Nonsense Khan, this sort of fanny behavior is to be expected. Getting branded as “radicalized” or “in some stage of radicalization” does not need advocacy for violence – nope – no violent behavior is needed .. but from legally protected social, political and religious activities. If you are a faithful Muslim who does not eat pork, drink alcohol, are active in your community, and hold “anti-Western” beliefs, such as believing that the Palestinians are getting the shaft from the Israelis – you can be deemed “radicalized” to the NYPD – which means you are potentially dangerous. Oh the irony-what could be the reason for it?